Continuing detention powers aimed at “suspected” terrorists are the latest set of draconian laws to be introduced by the Liberal National government. Today’s announcement carries on a trend of laws that do far more damage to our civil liberties than they do to protect public safety. “Today’s announcement will not make us safer, undermining efforts at rehabilitation and fundamental principles in the common law. “These are thought crimes where the evidence will be given by prison officers with minimal regard to essential legal principles such as the presumption of innocence and credible independent evidence. “There is a very real concern that these new powers could see individuals jailed for an additional five years based on prison officers taking a dislike to them. “We cannot create a parallel criminal justice system based on rumour, innuendo, suspicion and prejudice. “The NSW prison population is already at a record high and if the government was serious about community safety they would be investing in rehabilitation not more punitive measures. 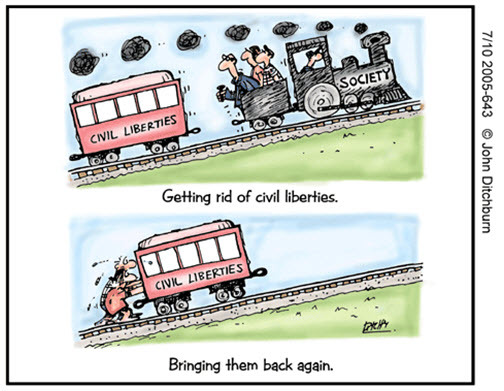 “Over the last six years civil liberties have been under consistent attack from this Liberal National government. “Whether it’s shoot to kill powers, investigative detention, public safety orders, anti-protest laws or oppressive bail laws, we are well and truly on the path to becoming a police state. “We are not made safer by surrendering our freedoms in the name of the war on terror. “We are letting terrorists win if just the fear of them makes us give up what makes us a free and fair democratic society.” Mr Shoebridge said.